A change in the mindset of the medical community, shifting a doctor’s responsibility from the good of the patient to the good of the group, has wrought deadly consequences, a Catholic medical doctor warned parishioners in Queens. Dr. Lisa A. Honkanen, a geriatric specialist, said she cannot remain silent on the assault on the dignity of life she has witnessed. She was invited to speak on end-of-life issues at Sacred Heart Church in Glendale, last Sunday, Feb. 4. “When the beginning of life becomes so cheap, the end of life becomes even cheaper,” Clara Sarrocco said during her welcome address. Sarrocco is a parishioner of Sacred Heart and member of the Long Island Chapter of University Faculty for Life, which sponsored the event. Sarrocco told attendees that it is important to stay informed to understand the battle currently being waged against human life, particularly in New York. She was referring not only to the recent passage of the Reproductive Health Act, which legalizes abortion in New York in all stages of pregnancy and decriminalizes unlicensed abortions, but also to the Medical Aid in Dying Act, currently being considered by New York legislators, which would legalize physician-assisted suicide. To explain why the political and medical climate has arrived at a point where it is debating how to easily end life, instead of how to best help individual patients, Dr. Honkanen started her talk with a bit of modern medical history. She said the change in modern ethics came with a shift in what was best for the group, rather than the individual, as illustrated in a medical paper titled “Ethical Practice in Managed Care: A Dose of Realism,” which appeared in the Annals of Internal Medicine back in 1998. “We propose the best medical interest of each individual patient be replaced with an ethic of devotion to the best medical interest of the group,” the paper states. Dr. Honkanen also presented Dr. Ezekiel Emanuel’s Complete Lives System from 2009, which argued that the most resources should be spent on helping those between the ages of 15 and 40, and reducing medical resources for everyone else. Shortly after Dr. Emanuel published his Complete Lives System, the strong legal push for assisted suicide began. Assisted suicide is the act of a physician prescribing a deadly amount of a drug, an intentional overdose, to a patient who then has to take the drug, fall into unconsciousness and die. This differs from euthanasia, in which a doctor administers the deadly drug. Assisted suicide in the medical community has been taunted as not only a valid option, Honkanen said, but even an obligation. Although assisted suicide through prescription drugs is not yet legal in New York, Dr. Honkanen said that has not stopped physicians from practicing more crude forms of the practice. She went on to explain the widely practiced procedure of Voluntary Stopping of Eating and Drinking (VSED). The procedure is triggered when a patient expresses a desire to die and officially refuses all food and water by mouth. To mask the symptoms of death by dehydration, medical professionals administer morphine and other drugs. “In a medical setting, if a patient changes his mind, this is viewed as delirium related to dehydration and nurses are instructed not to give the patient water and food,” Dr. Honkanen said. 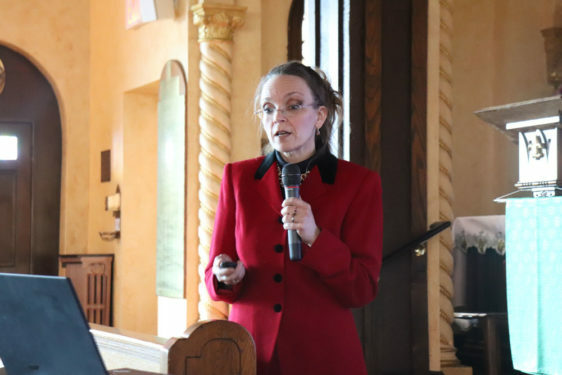 At the end of her talk, Dr. Honkanen offered the people gathered in the pews of Sacred Heart Church some practical tips to protect themselves and their loves ones. She said it is essential to choose a health care proxy who understands your wishes and faith. The person should be able to function under difficult circumstances and pressures, and be willing and available to fill the role. A health care proxy can evaluate the situation as things change and can flexibly make decisions that will be best at that time and space, something that is not possible with living wills. Although there is nothing ethically wrong with a living will or a Do Not Resuscitate (DNR) order, she warned that their meanings can be twisted and misinterpreted, and often these do not allow for the consideration of a changing situation. Although the intent of a living will is to preserve autonomy and help a family in a difficult situation, a living will can create more conflict because they tend to be seen as set in stone. To illustrate this point, Dr. Honkanen gave the example of a man who had a living will stating that he does not wish to ever have feeding tubes. When he was in the hospital and needed the tubes, he was denied food and water because of the living will. He even expressed his desire for the tubes, but his living will was clear. His son, his health care proxy, was convinced that it was delirium that was making him ask for water and that it would be against his father’s wish to have tubes. It was the man’s daughter who finally convinced her brother that it is not just to hold their father to a decision he had made when he was a different man. She convinced her brother that different things, more basic things, were now important to him. With the help of the feeding tubes, the man recovered, and was grateful that he did not have to die because of a decision he made before he really understood his future needs. Another problem with living wills, Dr. Honkanen said, is that the people reading them try to figure out what the reasoning was behind it and go with that. Even well-worded documents can be misconstrued. For example, she said, some hospices encourage patients to sign orders that basically say they do not wish to have extraordinary measures be taken to preserve their lives. In theory, that makes sense Dr. Honkanen said, but it does not allow for consideration of circumstances. To illustrate her point, she gave the example of a woman who was actually beginning to recover in hospice care and was soon to be released. The day before her official release there was a mix-up with her medication and she received someone else’s medicine and fell to the ground. A doctor was contacted who said she should not be rushed to the hospital because of her written directives. Do Not Resuscitate orders also present their own set of problems, Honkanen said. DNRs are very specific orders that state a person does not wish to have CPR performed on them in the case of cardiac arrest. It should be plain and simple, Dr. Honkanen said, but it is not. This order is often taken to mean that the patient does not want measures taken to help with other health problems. In some hospitals, that even means these patients get the lowest level of priority in the triage system, regardless of their level of medical need. At the end of her talk, Dr. Honkanen displayed the picture of a beautiful couple smiling and celebrating their 90th birthdays. Just months before the family had been advised that a feeding tube would not be appropriate for the wife because her quality of life would be diminished to the point where it would not be worth living. “Would she be better off dead,” Dr. Honaken asked rhetorically at the end of her presentation. Father Fred Marano, pastor of Sacred Heart Church, said he was grateful to Sarrocco and Dr. Honkanen for bringing the talk to his church. Even though he had gone through the difficult death of both of his parents, he said he had learned much and feels empowered to better speak on the matter. Father Marano said he also walked away from the presentation with a sense of validation. He said his family was being pressured to take away life-sustaining feeding tubes. The Catholic Church teaches that food and water can never be denied in care, even if through the use of feeding tubes. Father Marano felt good about not giving up and fighting for the rights and dignity of his loved ones. State Documents in Oregon indicate that 20% of their assisted suicide deaths could have been bullied by the corporate facilitators forcing the poison. I take exception to the push polls yes 60%, even the religious, favor the concept then 95% change to not-in-favor after they learn how easily the laws can be wrongly administered saying “I’m not for that”. Risking us all,all ages, to be exploited by predatory corporations and predatory new best friends or heirs. Read the language of the laws to decern the double speak, omissions and commissions to reveal the normalized, the exploited, the expended, the euthanized…. I would like to talk to the doctor and learn about the rules, can the patient be asked in the ambulance if the patient do not want to sign DNR/DNI to be taken to an hospital where palliative doctors will not harass the patient and family to sign DNR/DNI? Can there be a rule to ask the religion of the patient and offer to the patient a Catholic nursing home/rehab and hospital?